The Big Apple – New York City – is a city that you either love it or hate it. What makes this city so special? Through my week long trip to New York, I would like to show you the beauty within the city. 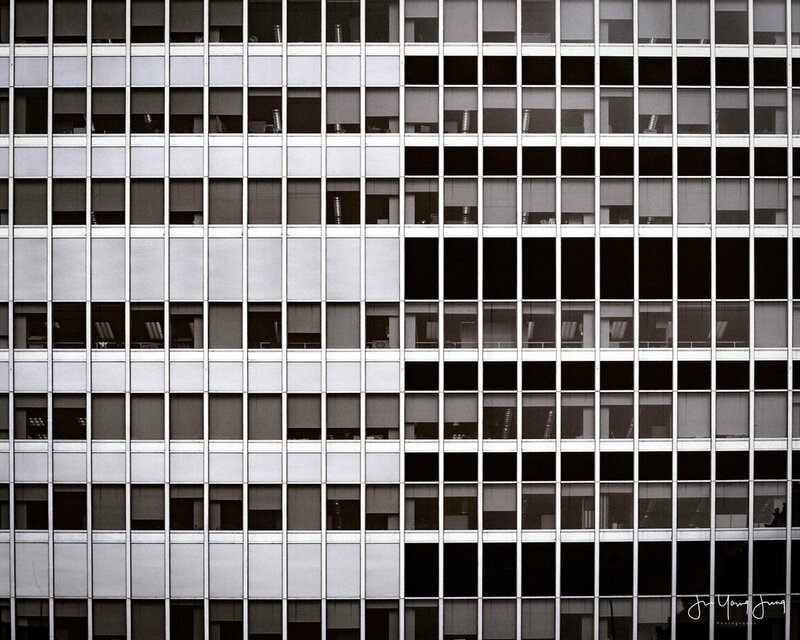 I looked for patterns and eye catching architecture. 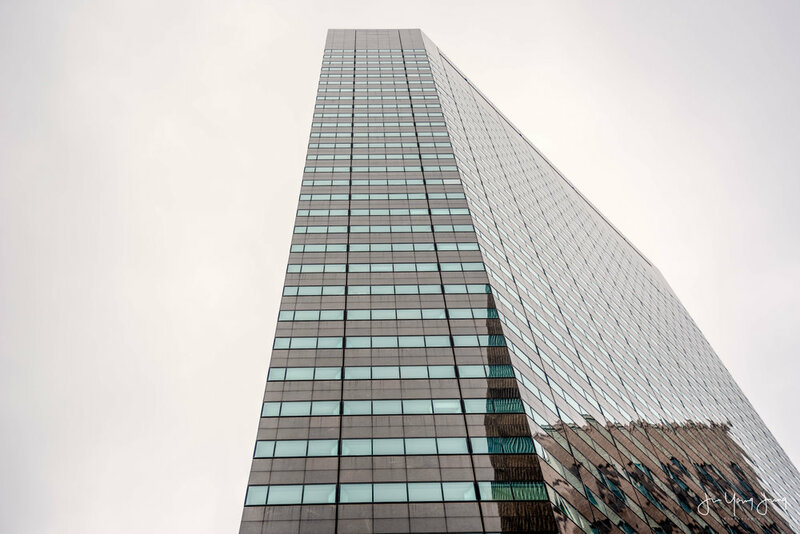 Although New York is filled with old, classic victorian buildings from as old as late 1700’s, it also features new, modern, and sleek curtain wall buildings. Long exposures and shutter drags can create quite an amazing effect to the image. This particular shot was taken using both ND filter, to give longer shutter speed, and gradient filter, to equal foreground and background exposure, to get best possible result in camera rather than relying using Photoshop. Photographing second sunset can be challenging. Lights are constantly changing, and you have few minutes to photograph, otherwise soft pink sun light will disappear. Although I have done this mostly in nature, it’s quite a view when done in citiscape. 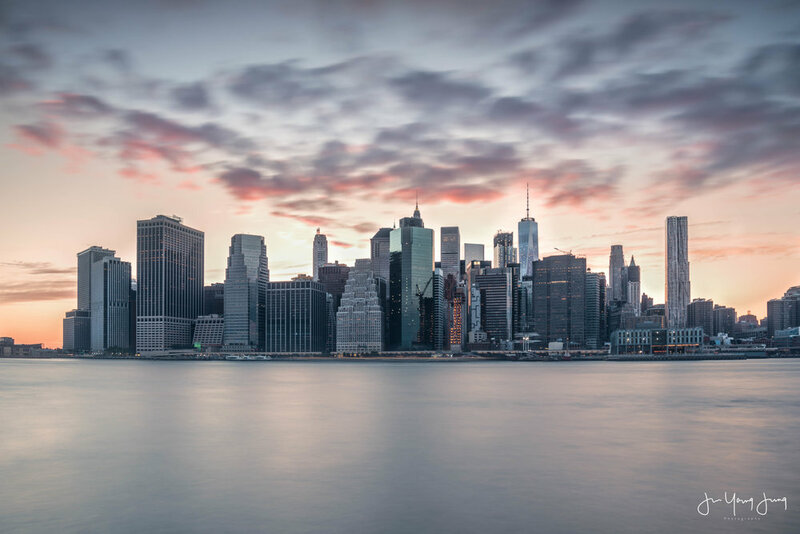 Sunset in New York – Purchase this photo through my print store! Night photography also rely heavily on long shutter speeds. To create sharp, lesser noise images, you must use fairly low ISO, some where around 200 to 800, and corresponding shutter speed which can be up to minutes. I was at the flatiron after the sunset. It was quite difficult to photograph flatiron due to lack of lights bouncing to the building, but 20 second exposure was long enough for me to create a shot. What do you think? 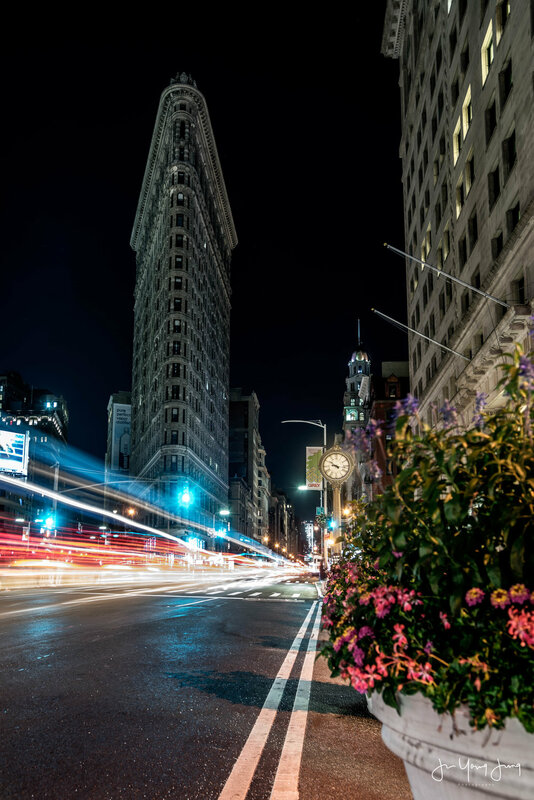 Late Night at Flatiron – Purchase this photo through my print store! Traveling in New York can be expensive, but if you find alternative, non-tourist method, you can visit monuments at fairly cheaper price. For example, instead of taking a ferry to the Statue of Liberty, take the Staten Island ferry. It goes right in front of Lady Liberty, and is great for taking photos. It also provides beautiful view of the southern Manhattan, give it a try! 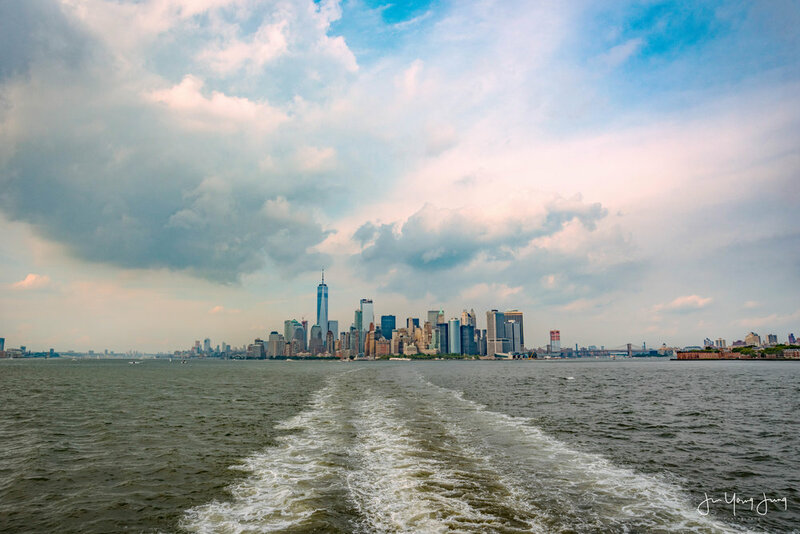 Southern Manhattan – Purchase this photo through my print store! New York trip can’t be full complete without the view from high altitude. I chose One World Observation deck to see the mid-upper Manhattan skyline. I went up there fairly close to sunset hours making it rich gold, oranges tone to the city. It’s a quite a view. 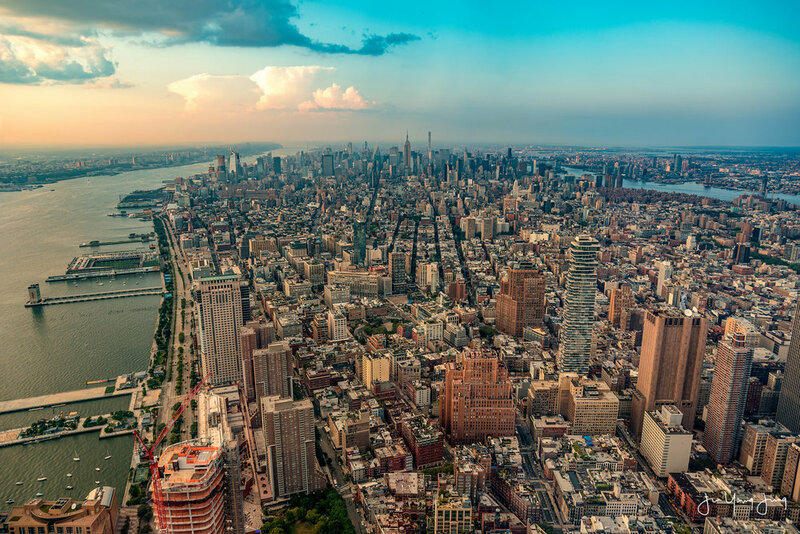 1300 feet above Manhattan – Purchase this photo through my print store! Lastly, I walked on the Brooklyn Bridge before the flight to see the New York City’s skyline for the last time. It’s always a pleasant walk experience. If you don’t like walking, try biking! 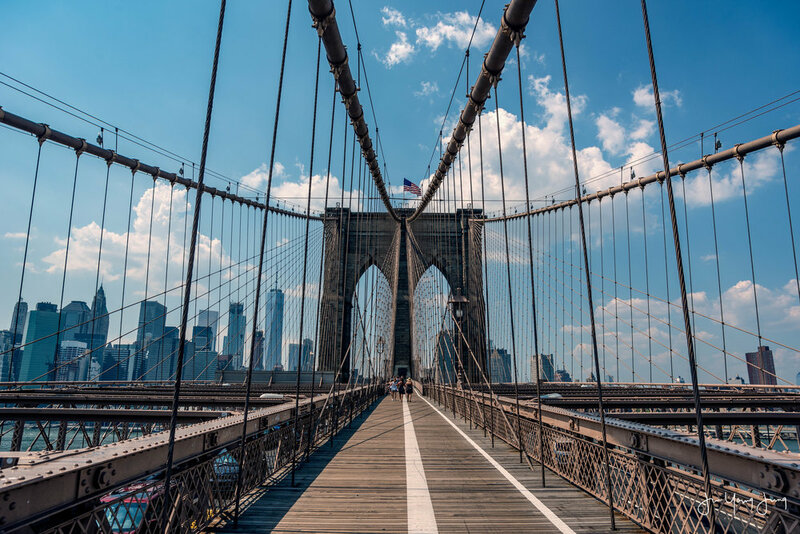 On Brooklyn Bridge – Purchase this photo through my print store! All in all, the trip was fun and filled with memories. When I visit New York, it’s always a different experience, and that is why I love this city little too much. If you are interested in purchasing one of my photograph, please check out my store or use the module below to purchase! Thank you. Thank you all for visiting my New York blog, check out my previous posts. All New York photographs are on sale until end of August! Thank you again, and like always, I will see you in the next one.